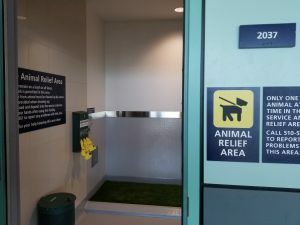 Oakland, CA (October 17, 2018) – Officials at Oakland International Airport (OAK) today announce the newest amenity for passengers flying with service animals. 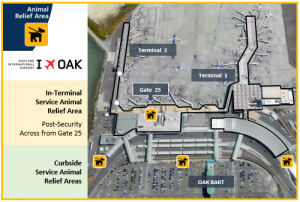 A post-security Service Animal Relief Area is now open near Gate 25 in Terminal 2 – the first space of its kind within OAK’s terminal facilities. Until now, travelers accompanied by approved service animals have had to rely on outdoor curbside relief areas. The new space – one of many recent and upcoming customer service upgrades at OAK – includes a 100-sq. ft. ventilated room, featuring a full sink, cleaning tools, artificial turf, and a miniature fire hydrant. OAK’s new Service Animal Relief Area was designed in partnership with Dogs for Diabetics (D4D), a local organization that pairs medical alert assistance dogs with insulin-dependent diabetics. 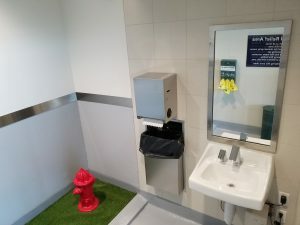 D4D’s input and feedback during the design process ensured that the facility was designed to promote a more enjoyable, less stressful travel experience for customers traveling through OAK with service animals. 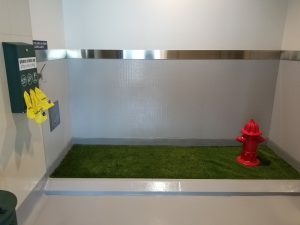 With an approximate cost of $650,000, OAK's new Service Animal Relief Area was designed by HNTB Corporation and constructed at OAK by Bay Construction, Inc. The project was introduced in 2016 when the Port of Oakland Board of Commissioners approved budget and staff plans to partner with a service animal training organization to design the space. Oakland International is the fourth busiest airport in California and second busiest in the San Francisco Bay Area. Serving over 13 million travelers annually, OAK is the closest airport to the region’s top business and tourism venues. It is also the closest airport for most local residents. Oakland’s air service roster to over 60 nonstop destinations is offered on 14 different airline brands – seven of which operate with OAK as their sole gateway into the San Francisco Bay region. The vision of Oakland International Airport is to offer customers a world-class experience and be the airport of choice for Bay Area residents and visitors alike. OAK is operated by The Port of Oakland, which also oversees the Oakland seaport and 20 miles of waterfront. Together with its business partners, the Port supports more than 73,000 jobs in the region and nearly 827,000 jobs across the United States.